When he was struggling earlier in the year, Noah Syndergaard was saying he was struggling now, but he’ll dominate in September. With how he had struggled in his last few starts, this seemed like a punchline waiting to happen. As it turns out, Syndergaard was right. Yesterday, he was simply brilliant in his first ever complete game. If not for a Jay Bruce throwing error, on a ball he should not have pursued and probably not thrown, the Giants would not have had a base runner since the fourth inning. If not for the Alen Hanson third inning triple, the Giants probably never score a run. All told, Syndergaard allowed one run on just two hits while walking just one and striking out 11. Syndergaard got more run support in the eighth as he helped himself a bit. After a Tomas Nido leadoff single, Syndergaard bunted it just right enough of the pitcher to get Nido, who got a great jump, to second. Amed Rosario singled to set up runners at the corners, and he’d then take the double play out of the equation by stealing second. Jeff McNeil brought him and Nido home with a two RBI single giving the Mets a 4-1 lead. With that three run lead and Syndergaard still at 99 on the gun, Mickey Callaway had every excuse he needed to keep Syndergaard in the game. The end result was a 114 pitch masterpiece and finally a return to the Thor we had been awaiting all season long. Game Notes: Syndergaard’s 10 wins leads the team. With the win, Syndergaard became the first Met to beat the Giants two times in a year since Steve Trachsel did it in 2003. Former Mets pitcher Mike Pelfrey has retired from the game of baseball after a 12 year career, and he has accepted an assistant coaching position with Division II Newman University. Now, Pelfrey can play the part of Rick Peterson in helping a young pitcher learn about which one of his pitches is like putting ketchup on ice cream. Reflecting back on Pelfrey’s career, I mostly remember the disappointment. There was his inability to jump from being the ninth overall pick in the 2005 draft to truly help an injured Mets rotation. That certainly stung when we watched Steve Trachselget pounded for five runs over the first two innings of a pivotal Game 3 of the 2006 NLCS. There was also Pelfrey being a part of the 2007 and 2008 teams that collapsed. In 2007, his September 24th start saw the beginning of a five game losing streak with the Mets losing six of their last seven games to see a two game lead become an embarrassing collapse. Pelfrey was a much better pitcher in 2008 with him going 13-11 with a 3.72 ERA. His improved pitching did not stop him from going 0-3 with a 4.06 ERA to help the Mets second consecutive collapse. Still, Pelfrey showed enough to give Mets fans faith for the future. To that end, the rotation was set up so he would be the first ever Mets pitcher to toe the rubber at Citi Field. The third pitch throw in Citi Field history would be deposited by Jody Gerut into the left field stands for a lead-off homer. Still, with Pelfrey, Mets fans always had hope for him, and we were waiting for him to finally turn that corner to be the front line starter we all imagined he could be. It just never happened for him. He followed a good 2008 with a disappointing 2009. He rebounded in 2010 by winning 15 games, but he then went 7-13 with a 4.74 ERA. By that point, we all figured he was one of those every-other-year type of pitchers. It all seemed that way when he jumped out of the gate in 2012. Through three starts, he had not recorded a decision, but he had a 2.29 ERA. His last start was an eight inning gem that would have been a win had the Mets not started that season with Frank Francisco as the Opening Day closer. A few days later, it was announced Pelfrey tore his UCL, and he was going to require season ending Tommy John surgery. With his impending free agency, this mean that April 21st start would be his last in a Mets uniform. It would seem somewhat fitting his last win in a Mets uniform was from the previous August when he had a six inning three earned run quality start against the Phillies. That was Pelfrey’s Mets career. His flashes of brilliance really led nowhere, and you were left to look for the little joys in his moments of mediocrity. Still, it wasn’t all bad memories. He did bring hope with him. He was a player who chomped on his mouth-guard and kicked his fingers while he tried so desperately to succeed. As noted, there was a few seasons he did succeed. There was also a signature moment. In 2010, there was a crazy 20 inning game between the Mets and Cardinals. With the Mets out of relievers and the team desperately clinging to a 2-1 lead, Pelfrey entered the game despite throwing 106 pitches just two days prior. On that day, Pelfrey saved the day. That was always the case with Pelfrey. He was always willing, and he did all he could to improve even if that meant his stop putting ketchup in his ice cream. In the end, he put together a 12 year Major League career full of adversity and perseverance. It’s a career un which he can take much pride. It’s one that will be of immense value as he now seems to impart his wisdom to a new generation of pitchers. As a Mets fan, I know I wish him the best of luck. This postseason Terry Francona relied heavily on this three best relievers throughout the postseason. One reason why he did it was Bryan Shaw, Andrew Miller, and Cody Allen were all terrific relievers. Another reason why is the Indians starting rotation was decimated by injuries. Carlos Carrasco and Danny Salazar were out of the rotation due to injury before the postseason, and Trevor Bauer lacerated his hand while fixing a drone. Francona was forced to do what he did in the postseason. It was not unlike Willie Randolph in 2006. Like Francona, the Mets were running away with the division when disaster struck. Their ace, Pedro Martinez, was ruled out for the postseason due to an injured leg, and then all hope of his return for the postseason was abandoned when it was discovered he had a torn rotator cuff. While Steve Trachsel was purportedly healthy a year removed from a cervical discectomy, he wasn’t the same pitcher anymore finishing the year with a 4.97 ERA. On the eve of the NLDS, Orlando Hernandez (“El Duque”) suffered a torn calf muscle thereby putting John Maine in position to start Game 1. Overall, the Mets starters pitched 47.2 innings that entire postseason meaning they averaged 4.2 innings per start. This year, the Indians starters pitched the very same 4.2 innings per star those 2006 Mets did. Despite Francona and Randolph having the very same approaches to the postseason games, Francona was hailed as a visionary and a genius, whereas many blame Randolph for the Mets failures in the postseason. The difference? It started in Game 2 of the NLCS. Mota infamously shook off Paul Lo Duca, and Scott Spiezio hit a game tying triple. When Billy Wagner subsequently allowed a So Taguchi lead-off home run, it was a completely different NLCS. Then in Game 7, Aaron Heilman left a change-up up in the zone, and Yadier Molina hit a go-ahead two run home run. If not for those two mistakes, the Mets are in the World Series, and quite possibly, it is Randolph, not Francona that is seen as the visionary. But the Mets lost because their pitchers did not execute in the two biggest moments of that series. As such, Francona is the genius because to the victor goes the spoils. When the trade was made in 2006, Baerga switched to number 8 for the 1997 and 1998 seasons. We all know by now it was an awful trade. Baerga provided the Mets with a triple slash line of .267/.302/.373 with 18 homers and 116 RBIs. The man he replaced, Jeff Kent, turned out to be a career .290/.356/.500 hitter with 377 homeruns and 1,518 RBIs. He was the 2000 NL MVP. He is the all time leader for second baseman in homeruns (351), RBIs (1,389), slugging percentage (.509), and doubles (560). I remember my Dad was angry when the trade first took place, and he would become more irritated each and every passing year. Now, record wise, 1997 and 1998 were pretty good. However, 1998 was heartbreaking. For all the fans looking for a repeat of 2007 and 2008 after a couple of losses to the Marlins, they forgot about the original collapse. The Mets had a one game lead over the Cubs and four games over the Giants with five games remaining (seven for the Giants). The Mets lost all five of their remaining games. They were home as the Cubs and Giants had a play-in game for the Wild Card featuring future Met Steve Trachsel, and former Met, Jeff Kent. In those final five games for the Mets, Baerga went 2-13 (.154) with no walks, one RBI, no extra base hits, and one game on the bench. He wasn’t the only one responsible for that collapse, *cough* Mel Rojas *cough*. However, the Mets were stuck with Baerga while Kent was in the play-in game. It just shows you how changing one player for another can have a profound impact on your season. With this year’s flurry of trades, it’s something Mets fans know well. 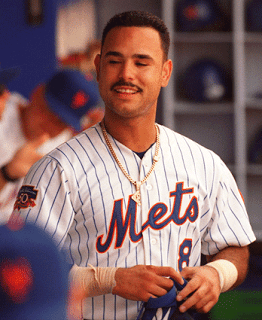 So let’s tip our cap to Magic Number 8, Carlos Baerga, who shows us, in part, our fears of collapse are behind us. Also, take this time to remember the late, great Gary Carter. Je me souviens. Rest in peace.